This post may contain Affiliate links. This simply means if you use this link to purchase an item I get a small commission at no cost to you. For more information refer to my Terms and Conditions. I designed the Find Your Flock Flamingo Wallhanging as a reminder to never hide your true self. What ever your interest or hobbies there is a group of people that will love you for who you are and you will never find them if you don’t just “Be You”. When I was in high school I loved to crochet. I brought my current project with me to school and worked on it in class. Well high school kids were high school kids and I would get called “Grandma” and they would ask me where my walker was. Kids could be mean, but I did not even give them notice. I loved to crochet. Plus my Grandma was the best cook, baker, and seamstress in our town. I wanted to be like her! After working a number of years in the customer service business, I find myself diluting my personality into something acceptable by a big corporation. I would hide myself behind professionalism. Now that I am a stay at home mom, I am rediscovering who I am and I could not be happier. 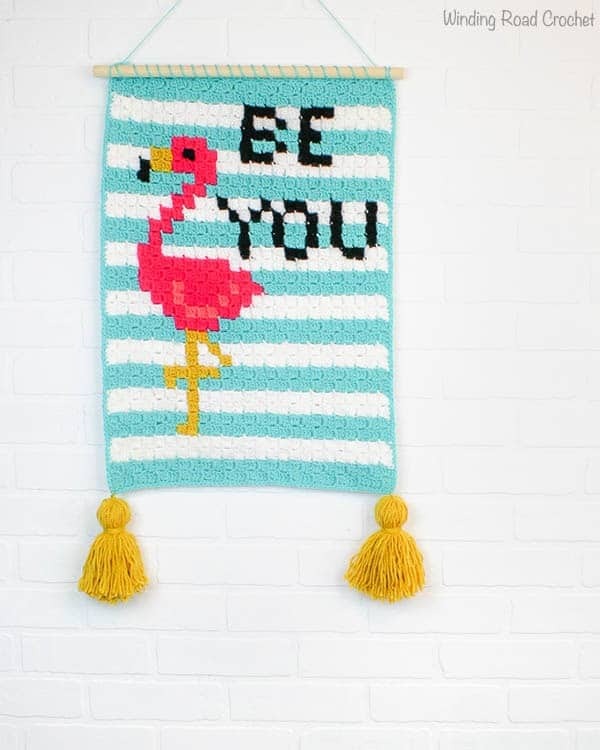 My Find your Flock Flamingo Wallhanging was created to remind me to be me and I know it will encourage you to do the same. I have fallen in love with the simple pixel design of a corner to corner crochet project. Corner to corner projects are not difficult but do take some concentration to follow the pattern. These types of multicolor projects can be extremely rewarding. The corner to corner crochet stitches have a great texture and adding tassels to the bottom really make this wall hanging very unique. I really enjoy working on corner to Corner crochet graphs. I get excited every time I get to add a new color. Once you get the corner to corner crochet technique down it is easy to do but the graph adds a nice challenge. If you are not familiar with the Corner to Corner Crochet technique Jess at Make and Do Crew has a great blog post and video tutorial for C2C. The stripes on this wall hanging requires you to change colors a lot but I think the final look is totally worth weaving in the ends. Hate weaving in ends? I have provided a short cut that you may want to try. Scroll down past the pattern and you will find my trick to skip weaving in 80% of your ends. This trick only works on projects that are meant to be one sided. If you are looking for a bigger Corner to Corner project this fall, keep an eye out for my Woodland Winter Wonderland project I will be sharing over the next few months. Love to Crochet? Check out some of my Free Summer Patterns! I have provided a graph for this Flamingo Wallhanging. You will work a total of 58 Rows. I have placed numbers on the edge of each row to helps you work through the graph and placed a faint grey line over every other row to help you keep track. There is also the written pattern below if you prefer to use that. I used Lion Brand’s Vanna’s Choice because it has a beautiful range of colors and a very soft feel. I listed the approximate yardage you will need for each color. Working the Corner to corner rows. Wall Hanging with out tassels = 16 inches wide x 24 inches tall. Click below for the Printable graph without the extra diagonal guide lines. Click below for the Printable graph with diagonal guide lines. Using that graph works great for some of us, but others like to have the written pattern, so I have provided both. I actually used the written pattern for most of the project and just used the graph to make sure everything was looking correct. If there is no number listed next to the color, that means only make one square of that color. Odd rows go from Left to Right, and Even Rows from Right to Left. Stop increasing on the bottom of the wallhanging after row 25. Stop increasing on the top of the wallhanging after row 34. NOTE: You will no longer be increasing each row on the bottom side of your work. Place a stitch marker at the end of row 25 to indicate which side is no longer increasing. NOTE: After row 34, you will no longer be increasing on either row. To finish my flamingo wallhanging I crocheted a row of single crochet around all the edges. My method for Single crocheting was to Single Crochet into the top of each Double crochet and place two Single Crochet into every turning chain. This method worked great for me, but as long as you Single crochet evenly along the sides yours will look great. Edging the wallhanging with single crochet just makes the edges look cleaner. I also decided to make some very chunky tassels to attach to the corners, but this corner to corner hanging would also look nice with a fringe at the end. I whip stitched the top to a dowel rod that I cut to the same width as the wallhanging and added a string to hang it by. Alright it is time to weave in all those ends. I actually was weaving in my ends as I went. I would do a few rows, then stop and weave in ends. If you plan to weave all your ends in, I highly recommend weaving them in as you go. Otherwise if you finish your project and you have ALL those ends hanging out it can seem overwhelming to weave them all in. So here is my short cut. Contact Paper! Here is how you do it. Weave in all the ends that are 1-2 inches from each side and 2-2.5 inches from the top and bottom. Pull all the remaining ends to the back of your work and pull gently pull to tighten your stitches. Cut remaining ends to 1.5 inches long. Take a piece of contact paper and cut a piece to fit over all your remaining ends. Peel back the paper and apply the contact paper to the back of your flamingo wallhanging. Press down firmly. Now the rest of your ends are secure! This trick will only work for one sides projects like wall hangings. Your Find your Flock Flamingo Wallhanging is complete. It is ready to be hung and to inspire you each and every day. My project is hanging in my craft room. Let me know how you like this free crochet pattern. If you have any questions leave a comment below and I will try and help the best I can. I hope you decide to make a Find your Flock Flamingo Wallhanging. If you do, I would LOVE to see a photo! If you share it on social media be sure to tag me @windingroadcrochet or #windingroadcrochet . I like to share your creations in my Instagram stories! What more free crochet patterns! Here are some of my favorites that I think you will love too. Written pattern, graphs and pdfs are copyright Windingroadcrochet.com. Please do not reprint or repost this pattern, graphs, pdfs as your own, but please feel free to share this link with others. You can find more information on sharing my work with others in the Terms and Conditions Page. This is just gorgeous. love love loveity love! Thank you, it was really fun to design and work up. Wow, I love this. Well done you!! Thank you so much. I love doing color work! I am so glad you like it.